If you think about it, the reason that I don't reply to you in Turkish is that I don't know the Turkish language, so I am not what you may call Hemshinli, but I am a Hamshetsi nevertheless . So far so good? I was born in Moscow, Russia. My father and his parents were born in Abkhazia. My paternal great-grandparents come from Samsun area (Ladik, Konukluk). My grandfather, although he was born in Abkhazia, learned to speak Turkish fluently, because it was a language of international communication in Abkhazia at some point. He knew much more about culture that Homshetsi Hye (Armenians) brought with them from Turkey (a land we collectively refer to as Dachgastan). Hamshetsi in Abkhazia and Russia are almost all nominally Christian. Some, of course, atheists, agnostics, since Soviet power discouraged any religion as much as possible. So that's my background. I know we had some older women in our villages wearing headcovers, although not as nice and colorful as Pushi. They just called them "lachag". Younger women never wore anything on their heads. But we are still part of Hamshen culture and heritage, although our great-grandparents were removed from Hamshen, as historians say, several centuries ago, then they settled in Canik (Samsun), Ordu, Trabzon and other areas. That's as much as I can tell. Whether we are ultimately coming from Iran is a questionable statement. I think we come from Armenia some 1000 years ago, but before that I can't even imagine. By the way, are you a Turk or Hamshetsi? It was not the reason that you don't speak Turkish i asked you cause you asked me something about "pushi". but i thought, everybody knows these things. anyway, forget it. Thanks for your explanations. Interesting story. Do u know, I have some relatives in Ladik. What is "Hamshetsi", Of course I'm a Hemshinli. These are different things or same things? If you are Hemshinli, too, so we are brothers Right? Maybe Iran is not. Probably it was Hemedan or Horosan. I've heard something about this theme. But Now I dont remember very well. Sorry. The assumption that pushi is a common symbol or different Hamshen groups is unfortunately wrong. The other groups of Hamshen origin, namely the Hemshinli people of Hopa, those of Russia, and those in Surmene/Karadere (Trabzon) do not know it. Furthermore, my understanding is that Cayeli Hemsinlis (and maybe those in Ikizdere too but I am not very sure) got acquainted with pushi in recent decades (I don't know if it is the same with those in Ardeshen and Findikli, maybe sombody can tell us). So, following the above facts, the normal assumption here is that the Hemshinli of Hemshin/Camlihemshin and Pazar areas recently acquired that headscarf (within about 200 years) and made it a cultural symbol in recent decades. As for the point of origin of the people of Hamshen, looking to Hamadan or Khorasan are futile efforts. These figments of imagination were hatched by the followers of Kirzioglu school in order to convince the Hemshinli that they came from Central Asia (even the Turkish government historians don't go as far as Kirzioglu people do in making up fake histories). There is not a single item in Armenian, Arab or other medieval sources that prove what Kirzioglu and his followers claim. The originals are in the museums. Kirzioglu says Hamam Amatuni came from the Turkish city of Hamadan and that's why he was named Hamam. Unfortunately for him, the name of that Iranian city was Ekbatana and Hamadan was adopted centuries later (those of us who had high school history education in Turkey will remember the name Ekbatan). The name Khorasan is not a Turkish name as most of Central Asia was really an Iranian area 1500 years ago. Back then the Turks were still living in the area between Mongolia, eastern Turkestan (in today's China) and eastern Siberia. Finally, a word on the starting point of the people of Hamshen from the lands which are part of Iran today. It is too simplistic to think that these people just represent the descendants of the people who lived under the Amatuni princes near Lake Urmiya in today's Iran just got transplanted to Hamshen. Linguistic, cultural, historical evidence shows that the people of Hamshen are at least as much (if not more) connected to Ispir, Trabzon, and other places. Please note that I am not saying that pushi didn't come from Iran. It looks like it did come from Iran but not in back history but in recent centuries. İLLETYUS, I think we both understand each other well, and I believe that's a very good start. Hamshetsi, or Homshetsi, or Hemshinli is a name for our people. Our people. That's it. Like one of my friends from Hopa told me recently "mek meg hokiink" = we are one soul. I have to agree. Our future may be different, but our past is the same, and it is very important. hagop wrote: The assumption that pushi is a common symbol or different Hamshen groups is unfortunately wrong. The other groups of Hamshen origin, namely the Hemshinli people of Hopa, those of Russia, and those in Surmene/Karadere (Trabzon) do not know it. if we are trying to find a common symbol i am afraid we are going to find nothing. it's impossible. I want to learn, where is the authentic lands of Hemşin people? Where is the source? Where is the origin? Where is the beginning? Russia, Abhazia,....or Armenia? NO. it's Hemshin. If so we have to try to find this symbol in Hemshin and Hemshin culture.I think so. avetik wrote: İLLETYUS, I think we both understand each other well, and I believe that's a very good start. Why impossible to find a common symbol? There are a number of words still common among these groups. It can be any of those objects. Failing them, I don't think anyone will object to pushi (which is pretty nice) as a common symbol. There are no single point of origin (hence no authentic lands) of Hemşin people as I said. If you subscribe to the story of their coming only from lands from the western side of the Lake Urmia (Hamam Amatuni story), that just explains a part of Hemshin origins. There is evidence that Hamshen was inhabited by Armenians before the second group of Armenians (Hamam Amatuni and his people) came. Afterwards, there were other Armenian groups. You see, there are no easy answers. We have to get out of the easy answers mode. Of course Russia, Abhazia, (or Istanbul) etc. couldn't be the beginning. They can be the end but not the beginning. Is Armenia the beginning? Well, what is Armenia in history? It isn't today's Republic of Armenia. Of the groups we have more or less evidence of migrating to Hamshen, they are all from historical Armenia. I do agree that the symbol is preferably looked in Hamshen, especially given the fact that they haven't forgotten Hamshen long after they left their homes there. 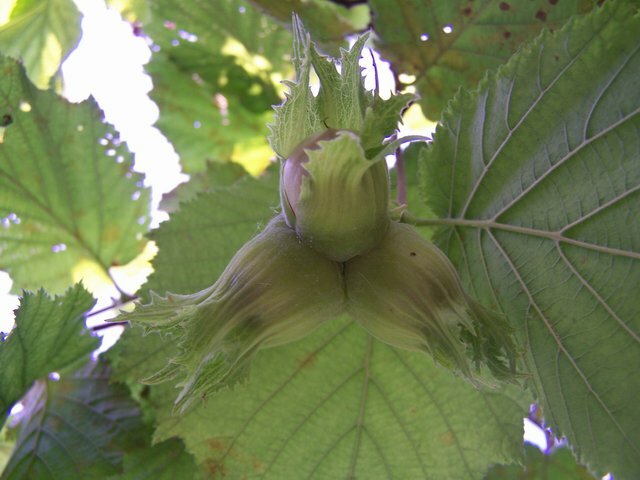 I suggest a hazelnut (funduk, gaghin) as a symbol of Hamshen. Not that it is unique, but the one I'm talking about is longer and even tastes little different. This one that Hayk already posted here, remember? And let me add, that it is a right symbol, because a lot of times Hamshetsi's are NUTS! Hagop, I agree that the question of Hamshen origin is not easy. Sometimes, I wish, I just had easy answers, but it sounds like the more you study, the more questions you get. We all have to have open minds in order to find out the truth. Having said that, can you please elaborate on the existing facts and evidence about Hamshentsi's before Hamam Amatouni?.. This is something I haven't heard before, and I would like to learn about. Sorry for the late response, I didn't see your posting until today. Some historians have pointed out the discrepancy about the dates of Hamam Amatuni's arrival in the area and other events. There is doubt that Hamam Amatuni is the same Hamam who supposedly built Hamshen. Also, there is a Hamam Mamikonian who was in the same area. It is well known that the Kachkar mountains had been then the hiding place of the Mamikonians for some time. One historian questions if it is likely for a severely handicapped person to live long in a rugged land let alone be able to rebuild a settlement. Амшенский крест, может подойдет на символ Амшена? Таво, а откуда информация, что этот крест амшенский? Что известно об этом символе? На изданиях Амшенской библиотеки используется этот символ. На сколько я знаю, этот символ нашли на одной из магил армянина в Абхазии. А значение ему придано такое же, как и бесконечности. На сколько я знаю. Ну это не крест, а орнаментальный символ или свастика.